IT IS ONLY VERY OCCASIONALLY that those of us on the outside of professional sport get a true insight into that elite world. I have always liked Ernie Els and, a few years ago, I could have hugged him when he drew my name out of a hat or crystal bowl—who knows?—and earned me an invite to play in the Dunhill Links championship, a fully-fledged tournament on the PGA European Tour. It was 2002. Originally, my pro-am partner was due to be Alex Cejka, a German player making a good fist of moving up the world rankings at that time but, unfortunately, prone to occasional back injuries. That week, Cejka was forced to cry off, quite late, and Chris Gane, an affable fledgling English tour player battling to retain his tour card for the following season, replaced him. I remember my first tee shot on the first day of the Dunhill Links. It was on the Old Course at St Andrews and my knees were literally shaking like jelly. I had been to the revered links on numbers of occasions to cover tournaments for The Irish Times but never played it. This was a dream come true. Ivor Robson, the starter, had introduced me—to a smattering of applause, believe it or not—and, suddenly, I was away over the famed humps and hollows, with a bagman who had 17 years of experience at guiding golfers over the links. On the Par 5 fifth hole, reality hit home in a big way. After a decent drive and a somewhat intelligent lay-up with a five-iron, I was left with 134 yards to the green. Of course, the third shot never went close to finding it. Richard, my caddie, was not impressed. ‘Do you know, that is the biggest green in the world,’ he said of the green that doubled with the 13th. ‘It measures one and a half acres, and you’ve managed to miss it with a nine-iron.’ His displeasure couldn’t have been worse if Nick Faldo had taken the shot. Needless to say, as a team, Chris and myself failed to make the top 20 who survived to play into the fourth and final day. Sadly for Chris, he failed to make the cut in the individual tournament, which was won by Padraig Harrington, and failed to keep his card for the following season. A bigger insight into the distress of those who had been in a similar plight to that of Chris came when we entered the locker room of the clubhouse at Kingsbairns on that third and, for us, final day’s play. Chris limited himself to an anguished roar, of frustration I guessed. Others had not been so restrained. Littered all around the room were broken putter shafts. Very few of those golfers who get to play in the Ryder Cup get to experience such levels of frustration, where one putt can literally mean having something to eat and not. Yet, if it is any inspiration for fledgling professionals, or those daring to dream the dream, many of those who made it to the 2006 Ryder Cup match at The K Club had struggled in their early playing days. And this applied to the two captains, Europe’s Ian Woosnam and the United States’ Tom Lehman, more than most. Woosnam had needed three visits to the European Tour qualifying school before finding his feet on tour. Before that, he had played the Safari Circuit in Africa where he used to travel in a camper van, and met his eating needs by surviving on tins of beans. He was to rise to become world number one, and a US Masters champion. Likewise, Tom Lehman didn’t find it easy to make it, initially, on to the PGA Tour. He became a global player and competed on the Asian Tour and on the secondary and third-tier tours in America before he found his feet. So strapped for cash had he been as he struggled to make any impact, Lehman had spent the early 1990s travelling from one tournament venue to another in a battered old car with 180,000 miles on the clock. His perseverance paid off: in a second lease of life on the PGA Tour, hardened by what he had endured on the road, he developed into one of the game’s great players. The highpoint came when he won the British Open in 1996. Back in those early days of struggling on tour, neither Woosnam nor Lehman could ever have envisaged playing, never mind captaining, teams in the Ryder Cup. But their talent eventually came through, and they arrived at The K Club as the leaders of two teams’ intent on making the 36th edition of the tournament the greatest ever. Of the 24 players who arrived in Ireland with the captains, 20 of them had successfully come through qualifying campaigns. The other four had been the captains’ ‘wild card’ selections. The United States qualifying entailed a two-year system loaded to the second half of the campaign, in the belief that in-form players would make the team. The result was a side that featured the top-three players in the official world golf rankings, but which also featured four rookies: Vaughn Taylor, Zach Johnson, JJ Henry and Brett Wetterich. The European qualifying covered two different methods of qualifying. The top five players were selected from a world points list based on world ranking points won over a one-year campaign, with the next five players qualifying from a European points list with earnings (one euro equalling one point) from counting events on the PGA European Tour, again over one year. It was a system devised to enable players mainly based on the PGA Tour to qualify without requiring a captain’s pick. As far as Team Europe was concerned, it was a system that had much going for it. THE RYDER CUP HAD STARTED out as nothing more than a gentlemen’s match between professional golfers from the United States and Great Britain when it was first staged in 1927. For many years, it was simply an excuse for American golfers to reaffirm their superiority over their British contemporaries. The remit for the British team was extended to include Irish players, one of whom, Christy O’Connor, went on to play in ten matches. But, more often than not, the result was the same: United States winning, Great Britain and Ireland losing. It all changed when Jack Nicklaus, the greatest player of his era, and a man with a record 18 majors to his name, effectively said that enough was enough. Even the great ones get tired of winning too easily and it was he who suggested that the net should be extended to include continental European players. So it was that Team Europe came about, and, in golf, Europe’s sporting nations found a common bond. The arrival of Seve Ballesteros et al transformed the Ryder Cup. In truth, nobody, not even Nicklaus, could have envisaged that the Ryder Cup would change as much as it did. It became the most white-knuckle ride in golf, with even major winners admitting to feeling nerves and wobbly knees and barely able to see the ball when standing on the first tee at a Ryder Cup for the first time. When Tom Lehman brought his 12 men to the K Club, his team were tasked with seeking to become the first from the United States to avoid a third successive defeat in the competition. Europe’s goal was entirely different. Ian Woosnam’s team— which included Darren Clarke, playing on a captain’s ‘wild card’ pick just six weeks after the death of his wife, Heather—were attempting to become the first European side to win three Ryder Cups in a row. Prior to the match, Woosnam had expressed the heartfelt feeling that the 2006 Ryder Cup would be a ‘beacon to fair play, intense competition and magnanimity.’ He had also suggested that he would require a ‘back door’ out if Europe failed to win, so passionate was the Irish golfing public. The scene was set for what promised to be a magnificent sporting event, and it did not disappoint. 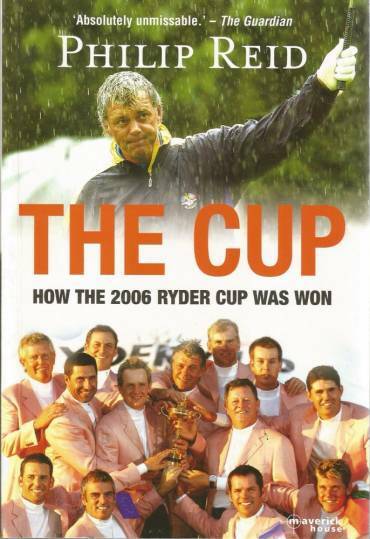 This is the story of how the Ryder Cup 2006 was won.